Many of the policewomen offered prayers outside the temple's main area or sanctum sanctorum. One of them last visited the Sabarimala shrine to Lord Ayyappa when she was a child. The Sabarimala shrine will open today and will close tomorrow at 10 PM. 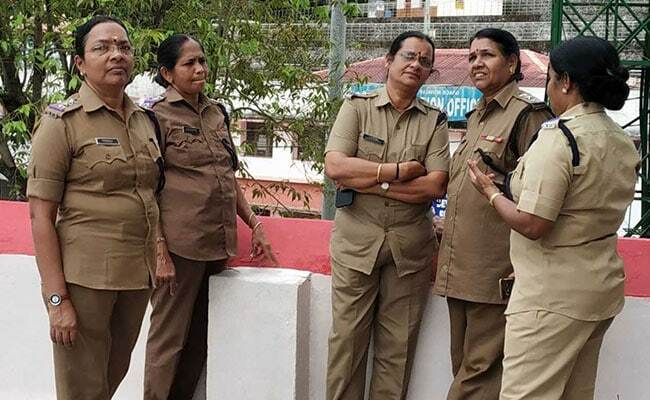 Fifteen policewomen have been posted for security at the Sabarimala shrine in Kerala, for the first time in its history. Their main qualification for this job is that all are 50 and above, compliant with the temple's ban on women of a menstrual age or between 10 and 50 years. Many of the policewomen offered prayers outside the temple's main area or sanctum sanctorum. One of them last visited the shrine to Lord Ayyappa when she was a child. Another woman officer told NDTV: "We have come here on duty. We have a job to do". No one is willing to talk about the Supreme Court order in September ending the ban, and the temple's refusal to accept it. "No comments," said everyone. After its opening today, the temple will close tomorrow at 10 PM. This is being seen as yet another attempt by the Left-led government to enforce the Supreme Court order. Atleast 12 women tried to enter the temple last month, none could make history as they were blocked and heckled by close to a thousand protesters who had stationed themselves inside the temple as devotees. One woman even suffered a panic attack. Two other women who came as close as 200 metres from the main temple zone also had to return after the chief priest threatened to shut the temple and stop rituals. On the ground, a large number of devotees, including women, believe courts should not interfere in matters of faith. The issue has become political with the two national parties, the BJP and the Congress, choosing to back those who are defying the Supreme Court order. The Congress has ruled Kerala and the BJP hopes to make inroads in the state where it has negligible presence. It has even launched a month long "Save Sabarimala" campaign.